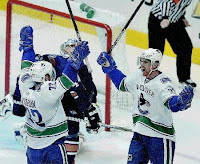 The Vancouver Canucks have re-signed the Sedin twins, Daniel and Henrik. The brothers signed identical five-year contacts worth $6.1 million per season with no-trade clauses included. Daniel led the Canucks in goal scoring with 31 last year and Henrik had a career-high 22 goals. Both finished with 82 points on the season. 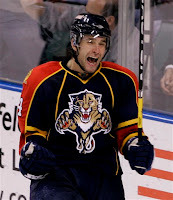 The Florida Panthers have re-signed winger Radek Dvorak to a two-year deal averaging $1.7 million per season. Dvorak, 32, scored 15 goals and had 21 assists with Florida in '08-'09. The 32-year-old Swede had 6 goals and 19 assists in 81 games with the Canucks last season. Toronto GM Brian Burke has accomplished one of his goals to make the Maple Leafs "tougher" by adding forward Colton Orr, signing him to a four-year contract worth $4 million. 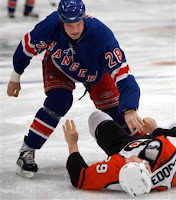 Orr, 27, played the last season with the Rangers and had 5 points with 193 penalty minutes last season. CBC reported that Alexei Kovalev has re-signed with Montreal. Kovi's agent refuted the report. TSN's Darren Dreger reports that Marian Hossa has signed with the Chicago Blackhawks and that Atlanta has traded for Toronto's Pavel Kubina.